We make KIDS COUNT! We are the go-to resource for data on child well-being and can help answer the question, “how are our kids doing?” Each year, we release new reports and snapshots to highlight important, timely issues that impact children. Our data center contains over 100 state-level and 40 local-level indicators on child well-being and is part of the Annie E. Casey Foundation’s national effort to highlight the critical role data plays in public policy. 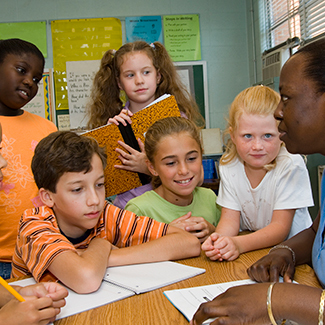 Our KIDS COUNT work helps inform our advocacy efforts and policy recommendations. 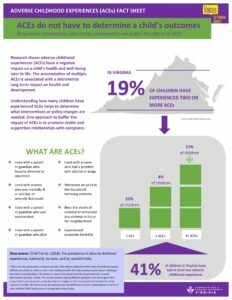 Our ACES fact sheet features several elements that provide talking points, data and useful information on the issues that affect Virginia’s children the most. The first component highlights data on the number of children who are impacted by ACES. The second part highlights connections between ACES and household stability. Need data on child well-being? Contact our KIDS COUNT Director Beth Nolan and visit the KIDS COUNT Data Center.